Are You Ready To Up Your Genealogy Education? Problems Registering for a National Institute Course or Package? Once you register and pay for a course, it will show up in the future course area of your student briefcase immediately after the payment is processed. The same is true for the course package. If they do not show up, please call or email us right away. Special Financing and Payment Plans Available! If finances are a little tight, call the number above and ask about The National Institute Payment Plan. With this plan, there is no charge interest, nor service fees, and you can spread the payments over several months! Don’t Delay – This Offer Expires at Midnight TONIGHT! Remember! This offer is for today only and expires at 11:59 PM EST, today, Wednesday, November 14th! Click HERE to get started! Leaders in Online Genealogy Education since 1997! 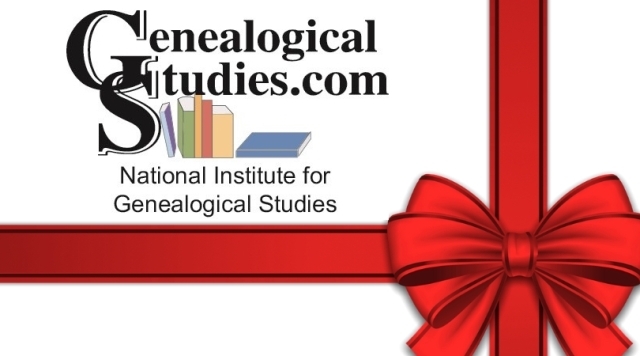 Enhance your knowledge: National Institute for Genealogical Studies offers over 200 online genealogy courses to help you research successfully. Formal education: We offer nine ‘country specific’ certificate programs (Australia, Canada, Eastern Europe, England, Germany, Ireland, Italy, Scotland, United States) and three specialty certificate programs (Methodology, Librarianship, Professional Development).